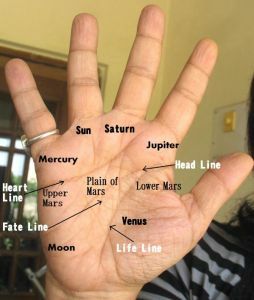 Hand Readings of famous people: What do Suresh Kalmadi's hands tell us? A comparison of Suresh Kalmadi's (politician and sports administrator in India) right and left hands tells us that his destiny changed because he changed. He writes with his right hand, and thus his right hand tells us about his current state of mind and the left his inherited qualities. by detail and miss the broad picture (shape of the hand, knots). Check out a hand photo of his here. Kalmadi has strong Mercurian qualities, which makes him naturally shrewd, sharp and skilful, but eloquence is a quality that he developed in himself over the years. Again, due to his own efforts. The strong Mars Mounts on Kalmadi's hands show his energy and determination, and also give him the ability to stand his ground. Such people are resilient, not easily discouraged, and do not panic in a crisis. On the downside, they can be quite dogged and resistant to change. Kalmadi has the aggression of Mars too, and the aggression has increased in his hand (from what he inherited), and temper has decreased. If one studies Kalmadi's Apollo and Jupiter phalanges of both hands it shows that he was not born with a love of luxury and the desire for status symbols, but these traits developed over the years. It is unusual for someone born with the ability to lead a simple life without a strong desire for the superficial symbols of power and status to develop these qualities to the degree that Kalmadi has. One is not sure why this change took place but it very likely happened when he was quite young. His hands also show the ability to adjust to circumstances, and this trait could have played a part in the change. In any case Kalmadi's Head Line shows that he was born with a materialistic streak, even if he preferred to be low key. Suresh Kalmadi’s hands are not that of an ideal politician. Good politicians need to be close to the people, and for this they need to possess warm, friendly personalities. They need to like people, and connect with them, like Nitin Gadkari for example. Or Nicolas Sarkozy of France. Kalmadi's Mount of Venus is weak in both hands, and this indicates a detached nature that does not sit well with a politician. If this trait is combined with the traits shown by his strong Mount of Lower Moon (which gives suspiciousness) then it can result in a distrust of people. Such people often make an issue of incidents which they perceive as “insults” or “slights” when actually no offence was meant. Their strong imagination, unwillingness to forgive, attention to detail, suspicious and distant nature aids them in this habit. This can affect their personal relationships as well. Kalmadi has been accused of corruption while organising the Commonwealth Games 2010, but such allegations are not new. He has been under suspicion for corruption before. Can a hand reveal a person's dishonesty? The hand only shows tendencies and Kalmadi’s left hand shows that he was born a straightforward and simple person. However, on his right hand the Apollo and Mercury fingers seem as if they are off their axis. If the fingers are indeed off their axis, it reveals an extreme desire for wealth and fame, and a person who will go to any lengths to obtain it. There is a penchant for taking risks and a loss of judgement. It also shows intense vanity which leads to a tendency to overestimate oneself. People with this sign often go too far and damage their lives, but without seeing the lines on the hand this cannot be confirmed. Related Reading: Read about the Sports Stars of the world, or the Politicians of the world. Suresh Kalmadi's father was reputed to be a simple type of person and perhaps this was what Suresh Kalmadi inherited. He must have changed after he joined politics, and Sharad Pawar. Yeah, I think so too. Politics is murky business and if one survives and thrives the dirt sticks.